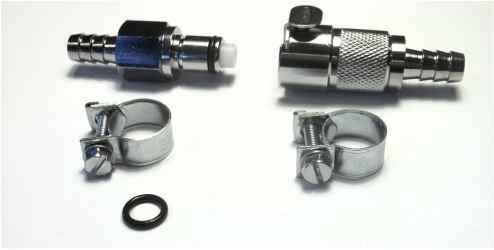 Brand New 5/16" In-Line Fuel Quick Disconnect Kit For BMW Motorcycles and Many Others. This kit includes EVERYTHING you see in the photo. This kit will do one fuel line. This is a great upgrade to replace your existing fittings or to add them to your older models that don't have them! Made of high quality chrome plated brass, complete with stainless components and viton internal / external seals to withstand today's gasoline. The fittings are internally valved to block fuel when you disconnect them! These are made by the same manufacturer who supplies the BMW factory with the original plastic units. These however, are the much higher quality products that won't break and leave you stranded. Add to that the danger of fuel dripping on a hot engine and they become a great investment. Many of the cheap after-market plastic connectors sold elsewhere are only rated for carburetor applications and cannot withstand the pressures of fuel injection. Ours CAN! These have become a very popular upgrade. There are BMW dealers that now carry this product and mark them up tremendously. Buy directly here and save $$$. Compare price and shipping, you'll be glad you did!